Katie Monnin provides the answer in the only resource to offer secondary ELA teachers classroom-based, standards-aligned strategies they can apply today: Teaching Graphic Novels: Practical Strategies for the Secondary ELA Classroom. Harness the power of graphic novels to promote literacy with standards-based strategies that engage secondary students! From navigating the text features in graphic novels to creating standards-based lessons on reading comprehension, fiction and non-fiction, written response, critical thinking, and media literacy, Teaching Graphic Novels shows you how to address print-text and image literacies while engaging readers like never before. 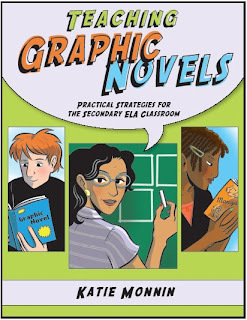 Complete with examples from graphic novels, professional resource suggestions, strategies that can be used with any graphic novel, and extra support for English-language learners, this flexible resource takes the guesswork out of teaching with graphic novels and builds in the fun. For more information on Katie Monnin and her work with graphic novels and literacy, visit www.maupinhouse.com/monnin.php. Looks great! I can't wait to pick up my copy!